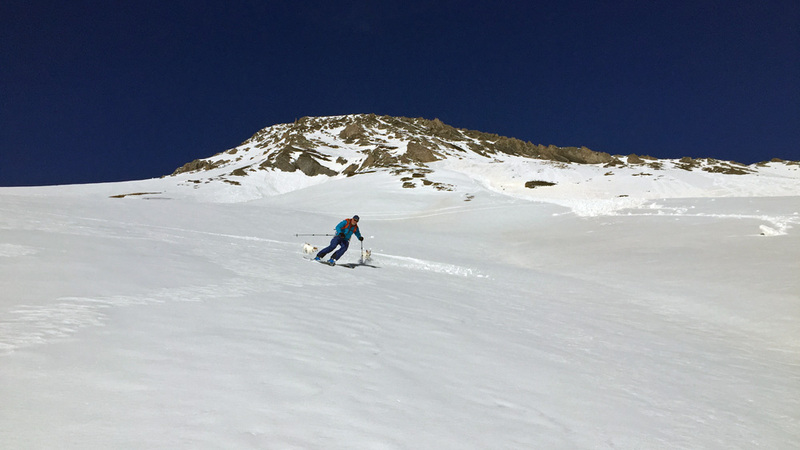 Just a few days ago we were in the vast backcountry in Serre Che, not meeting one person during a four hour ski tour and enjoying the mellow rolling gradient down from 2753m. Fast forward to yesterday and Gav's dangling off a rope on a gnarly cliff somewhere above Chamonix and I'm elbowing through the hordes in Morzine. More on Gnar Gnar Land - first hand report from Gav in Tour Guide..
Tuesday's tour was so good we decided to rest Wednesday and then do it all over again. 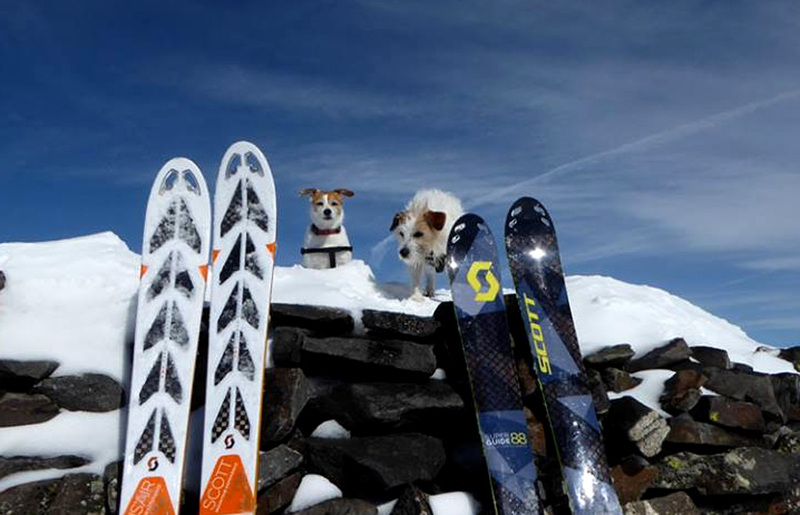 But can you actually repeat a good ski tour? 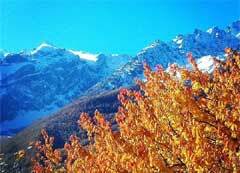 Will the weather, temperatures and snow pack ever be exactly the same? Wednesday night, the temperature dropped just below zero and Thursday arrived with clear blue sky and little wind so we had the green light to go with classic freeze/thaw conditions. But Gav had an eye on the thermometer rising and decided we needed to be climbing an hour earlier than on Tuesday.. So we collected Ken and were parked up the Granon road at 9.30am where there was already less snow than two days ago making it a bit of a sketchy hike for the first 100m vertical. And, yep, the thermometer was rising rapidly so we were soon shedding layers and climbing in just t-shirts and vented ski pants. 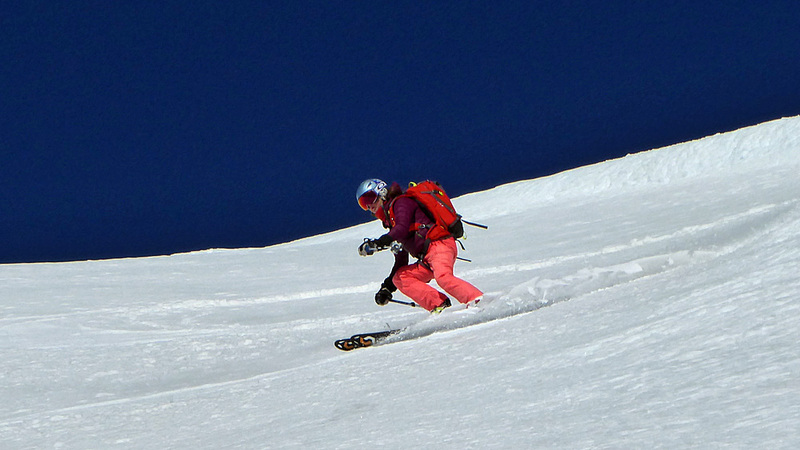 But as we got to around 2600m one of my skis slipped away from me on the increasingly icy pack. The higher we climbed the harder to get an edge - and I'd left my crampons behind that morning thinking it would be soft snow like Tuesday, especially as it was so much warmer. 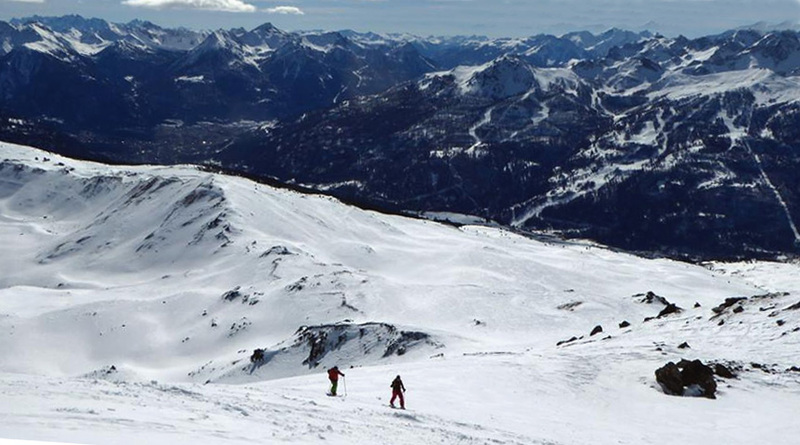 Shows you should never assume anything about a ski tour or try to predict the mountains. Finally, after another Bambi on ice impression and Gav's help up the final 10m, I made it to the top where there suddenly was a howling wind whipping around the 2753 peak and adding a considerable chill factor. Plus the cloud came over. No time for a snack or photos. 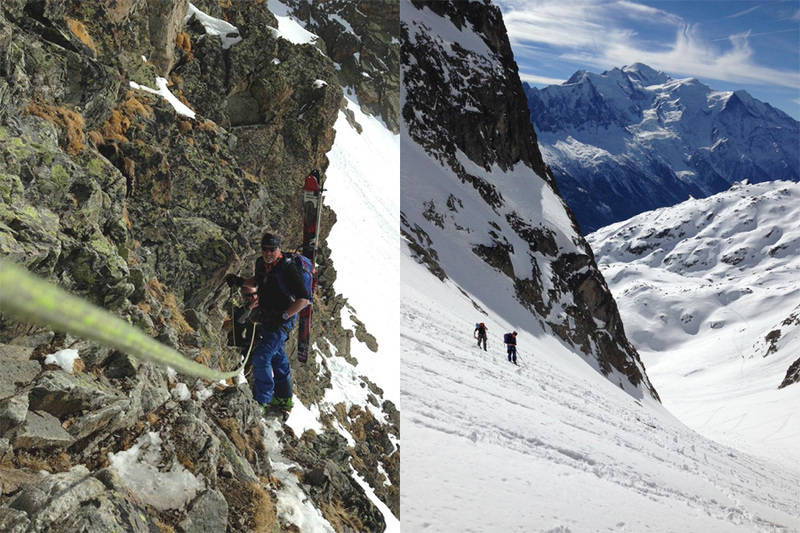 Jackets donned, skins off, boots adjusted, skis on - and off as fast as possible. Back down the hard, icy, windblown face to the shelter of a rock where we could stop for lunch, enjoy the breathtaking view from our office (image below) hoping the cloud would clear and the snow have time to turn. Around half a mile later, we hit the jackpot and it was spring all the way back for around two miles, with a few patches of grass and shrub at the end to hop over before skiing down the side of the road almost to the van. The plan was to ski tour with Ken and the Rando Chiens up La Gardiole, driving up the road as far as we could past the official road closure so as not to have such a walk to the snow. We woke up to blue sky so decided to go but by the time we were parked up there was high cloud and a chill brisk breeze. Would the snow turn to spring by the time we got to the top? So how was it? Spring all the way down, making fresh tracks for nearly 5k. 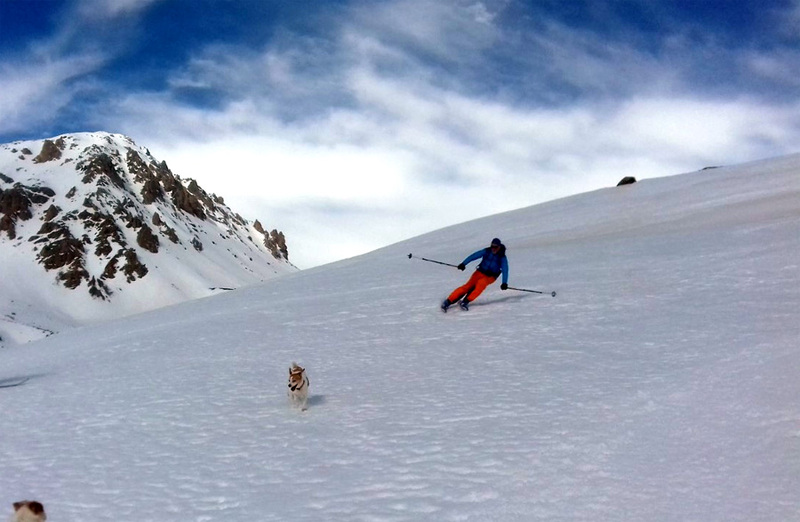 Probably one of the best ski tours we've done. High five to Gav for sussing out the route and the best snow. 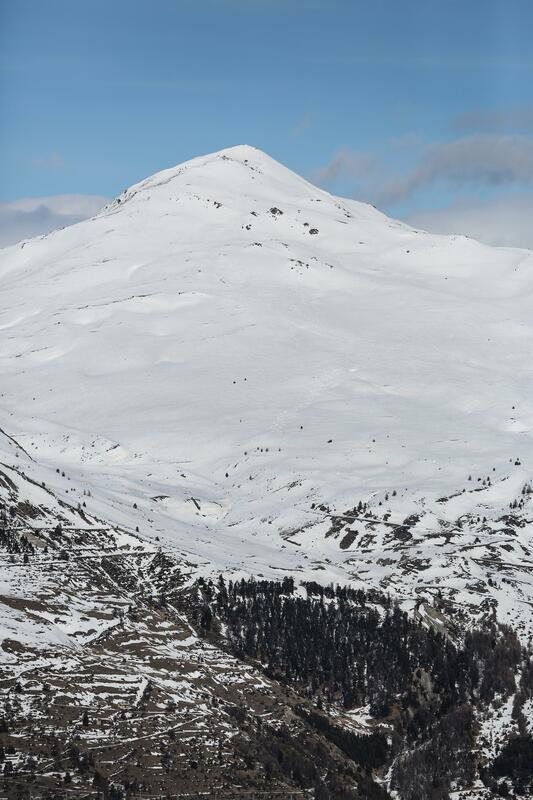 When we got home we discovered that Pike, aka mountain photographer, Michael Truelove, had captured our tracks from across the valley while he was shooting by the snow park in Serre Che. Here's the link to the high res image where you can zoom in. I left a week ago in winter leaving fresh snow and cold winds but returned on Saturday night to spring. 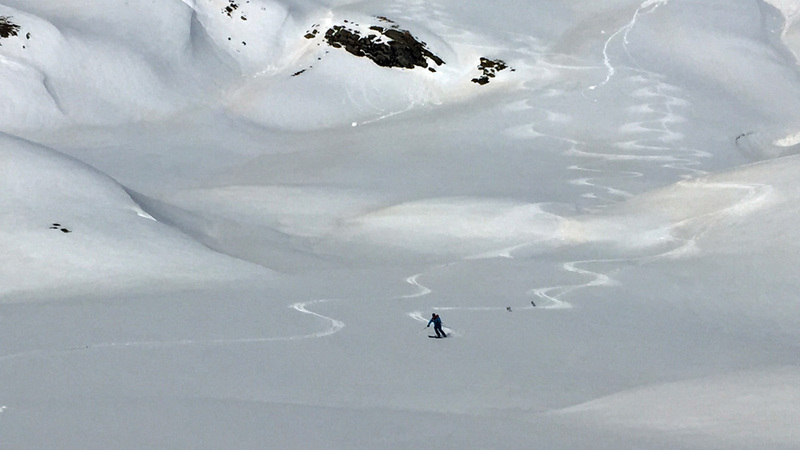 As Gav has been out scouting the snow conditions and found that freeze/thaw is creating classic spring, we decided to do some slackcountry and explore one of our favourite valleys off the back from the top of the Eychauda drag. It was around 12.30 when we were at the top and the snow had cooked nicely on the steep descent. Then there was powder in the shade.. But as the sun is still low, the less steep slopes didn't warm up to the same degree of melt so there was, also, plenty of leg ripping crust. After a varied two mile descent we arrived at the bridge below the track to the Rocher Blanc chair - about a 45 minute skin up. And I'm talking off piste! 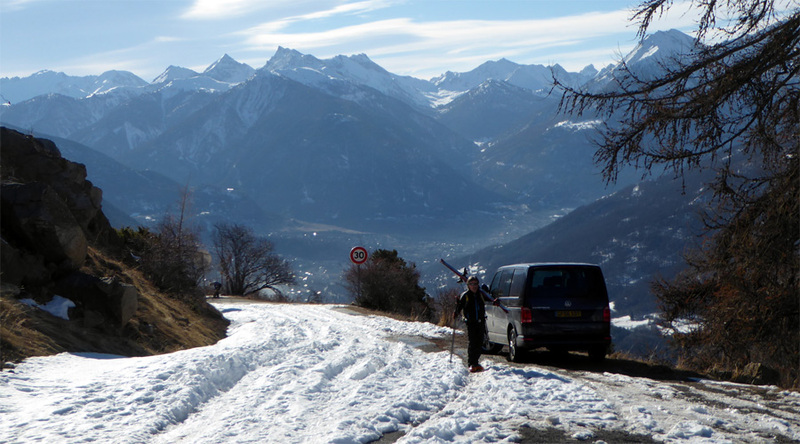 As we drove up to the Lautaret it was very busy with it being transfer day, however all the usual parking areas that we use when we go ski touring were rammed with cars & vans. Mainly groups of off piste skiers from Grenoble, I've never seen so many people. We ended up parking at the Gite as I know the owner, and popped in to ask if it was alright, he said "Thanks for asking, and at least you did, the ten other cars hadn't!" I was mildly confident that the route we'd take would not be busy, and was a good call as we had the whole side of the mountain to ourselves. 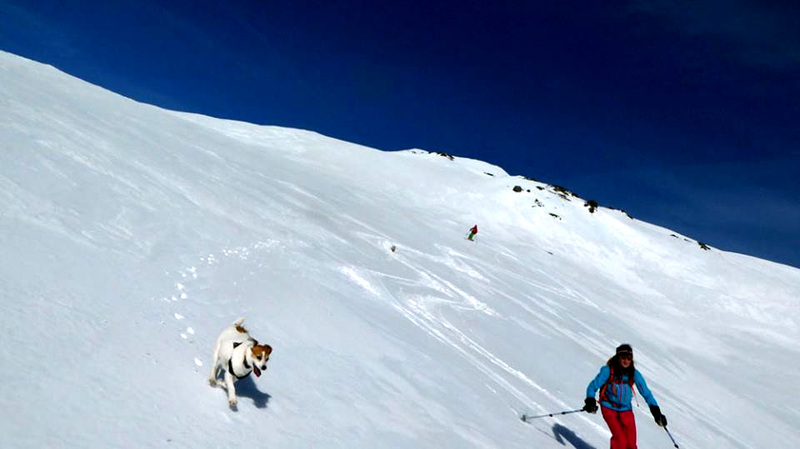 And as we had the Rando Chiens with us, we opted for the spring snow over the powder. Many people were saying how last week was the busy week, though judging by the traffic log jam coming into the valley last evening and the various parking areas rammed looks like this week is going to be even busier. I think a couple of Italian road trips might be on the cards. First real Spring ski tour of the season. 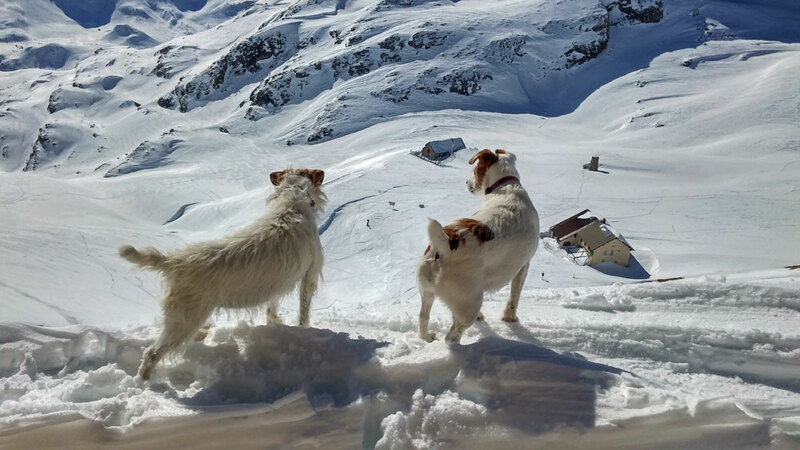 Climbed up to the Col du Galibier with Les Rando Chiens. Was a tad nervous about the snow as to whether it would soften up for the descent but there was no need to worry. Great to be up there away from the hordes, though have to admit it was quite tracked out so had to traverse high to get to some untouched bowls. And back up there again today. Amazing how quickly the snow has melted in the valley, especially on South facing slopes. Past couple of days temps in the afternoon have been +12, and felt a lot warmer in the direct sunshine. 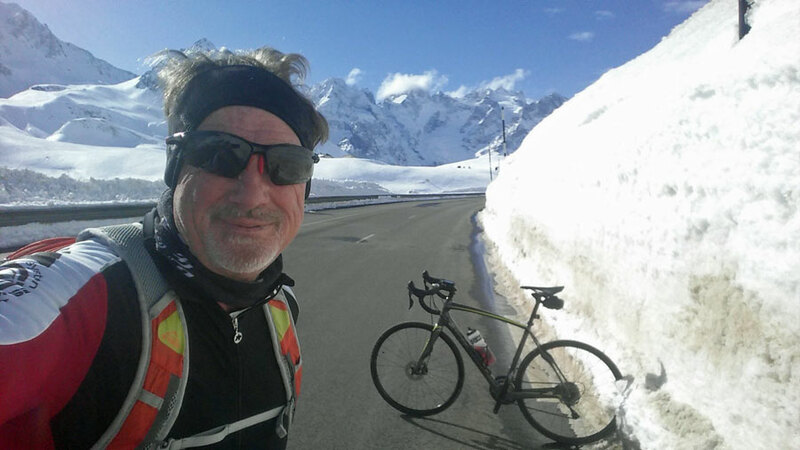 Wednesday I cycled up to the Lautaret and as you can see there's still a lot of snow up there. 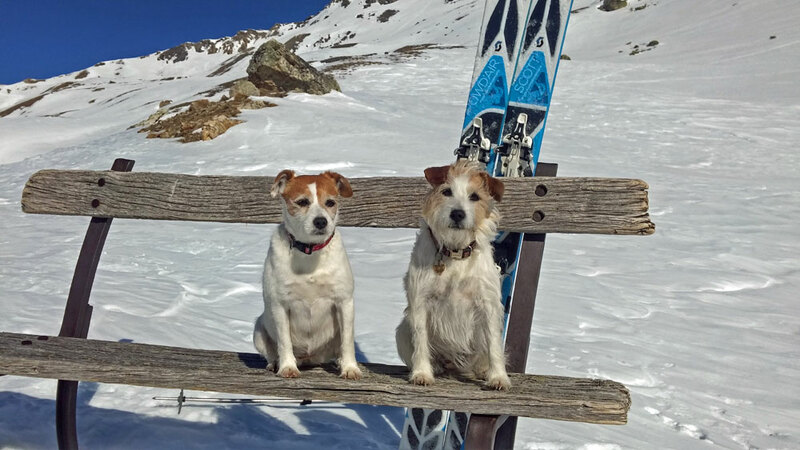 Today, Friday I'm going back up with the Rando Chiens to see if we now have Spring snow conditions after the last couple of days of freeze/melt. Went touring yesterday in Nevache and found good snow above 2,200 in the forest on a N/NW facing slope but lower down with the warm temps snow was getting really heavy. Weather still not right to produce Spring snow but hopefully could see snow transforming a little over the next couple of days. We were talking yesterday how we'd welcome the onset of safer Spring touring conditions unaware of the tragedy unfolding in Tignes. Lower down in the trees and the snow certainly was not too good for knee recuperation! Brace back on and gave it a go, and knee not too bad, though don't know whether it was my nerves or the hordes or being on light weigh ski touring kit on the mobbed hard pistes but was none too relaxing. 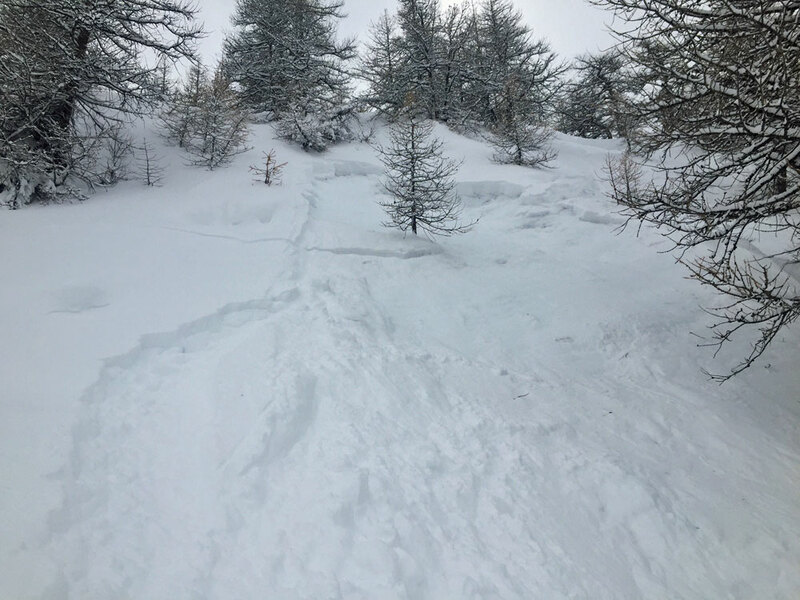 Unfortunately on Saturday there were two avalanches in the same sector off the back of Montgenevre with one dead, who was reported to be an ESI instructor. 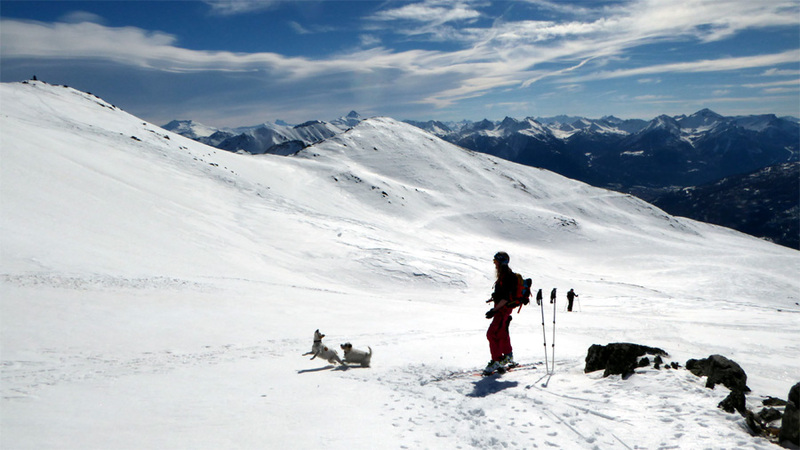 Temps are warming up this week, so here's hoping for some freeze melt cyclse to get to some safer ski touring conditions. For sure last week was busier than usual, but this coming week will be off the scale for the "hordes". For us here in Serre the urban metropoli of Toulon / Marseilles and Aix are on holiday, and for them, Serre is a lot closer than for the Parisians. 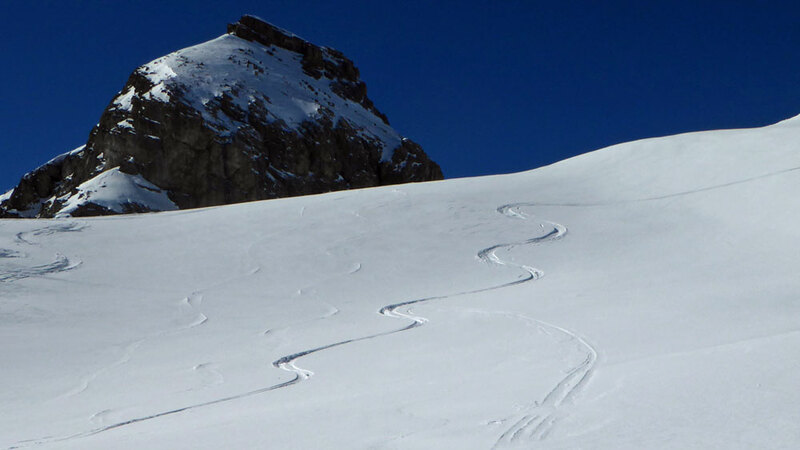 That said Pike and some of the local suspects did a road trip down to Abries in the Queyras yesterday and scored some great conditons and was not exactly busy. So we had a bit too much apres last night and I didn't make it up the hill, today. But Ken and Pike both went up and reported better conditions than yesterday thanks to '10-15cms of fresh on top of consolidated windblown'. There was good vis, this morning, turning cloudy later. Ken and I were at the Casse du Boeuf chair at 8.30am when it opens during half term holidays. But guess what? Yep, they said it would be closed till 9.00am because of avy blasting. Fair point but why can't they just go up half an hour earlier so the lift can open as scheduled? So it was 9.00am in the Frejus bubble and first up the Cretes drag, dropping off after the second pylon. 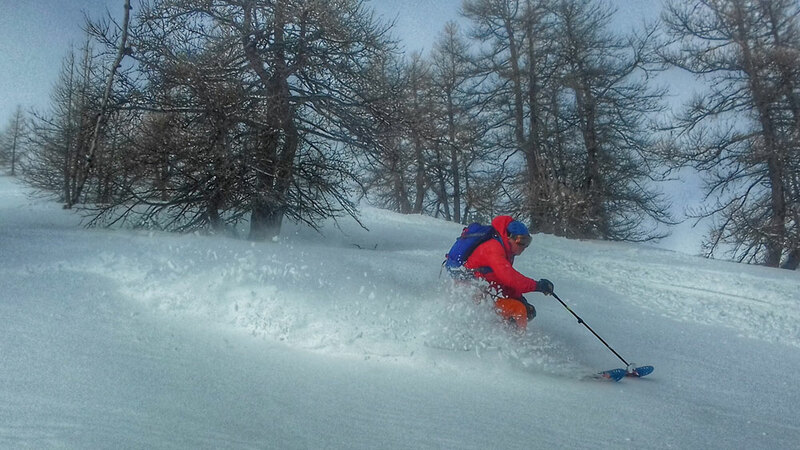 The light was flat and there was a definite crust with powder beneath, hard to let the skis run. Then the 'Slammer' (the chair that whacks you in the back) and hanger right. Windblown, hard and crappy. How about the trees? Up the Pre du Bois drag and we could see what everyone was doing on Monday in the wind. 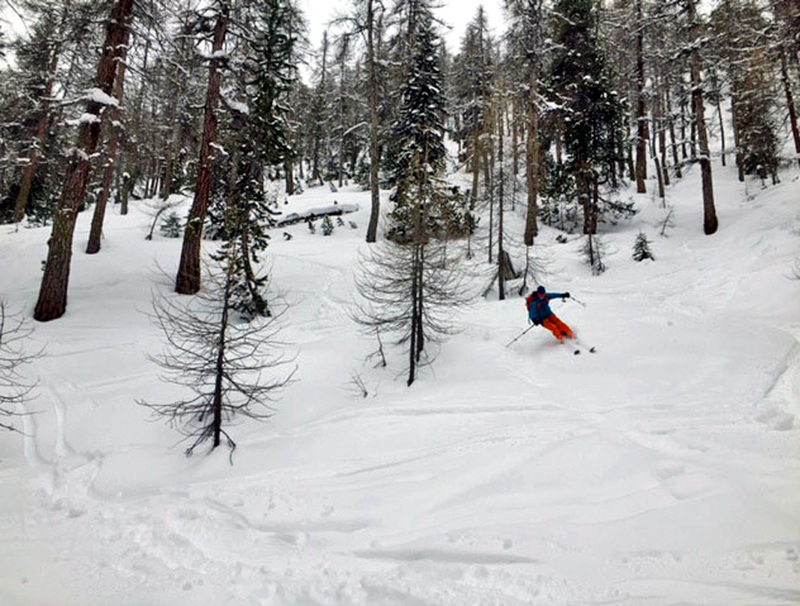 Skiing these trees. 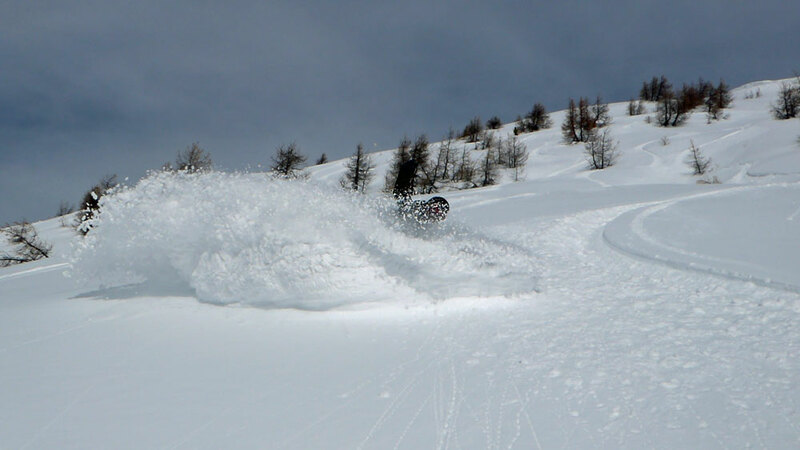 It was chopped up powder moguls between trees. Good for technique, but that's it. Currently it's snowing and bad vis. So I'm working on new features. 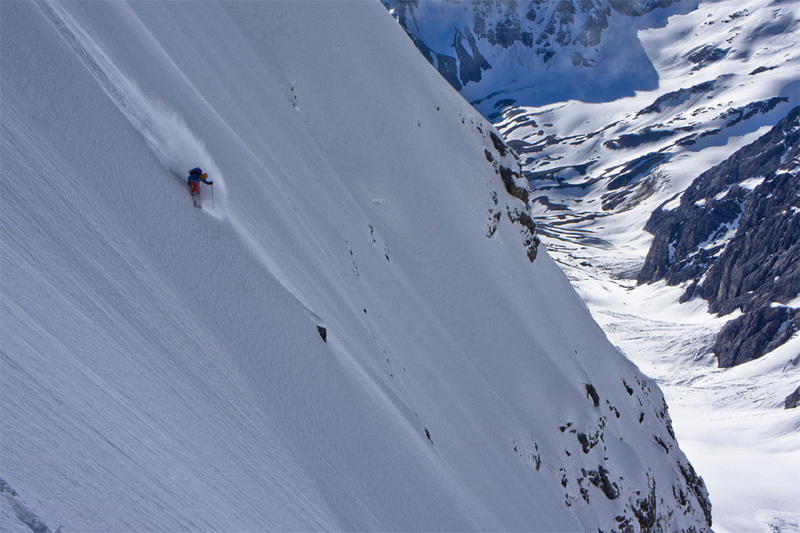 if you've got a moment, grab a coffee and read our latest about The Future For La Grave by their international mountain guide American resident, Joe Pro Vallone. 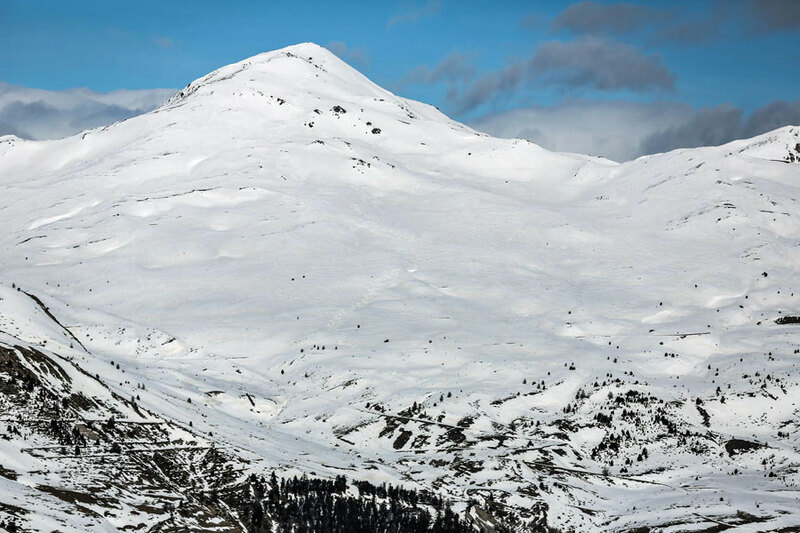 He enters the debate as to who should take over the lift concession, this April, and how to maintain the remote appeal rather than selling out to a conglomerate such as Les Deux Alpes, as fearlessly as he does the steeps of La Grave (below). It's a beautiful day if a tad windy! We were out for early lifts (those that are open that is) leaving Gav at home with his crocked knee after Saturday's adventure. 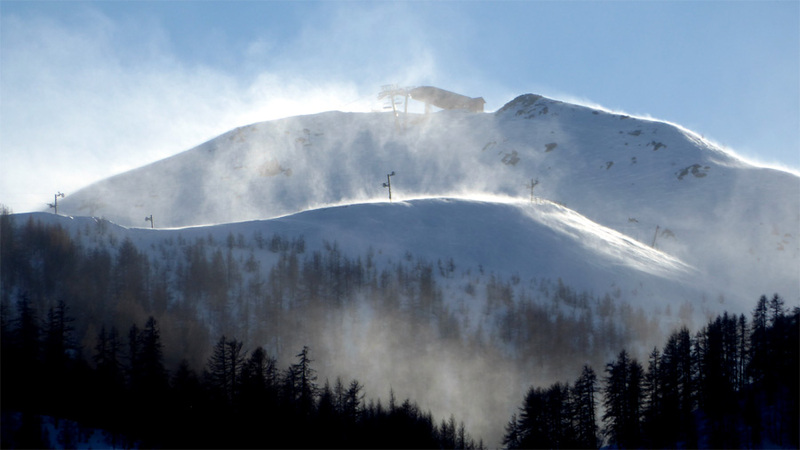 But with 30-40kph winds, all the top lifts were closed and, also, many of the lower ones,especially the gondolas.. So the queues at the resort level and at the mid station lifts that were open were packed with Jerrys. We did some sidecountry on the way down and called it a day! Better luck tomorrow, hopefully! 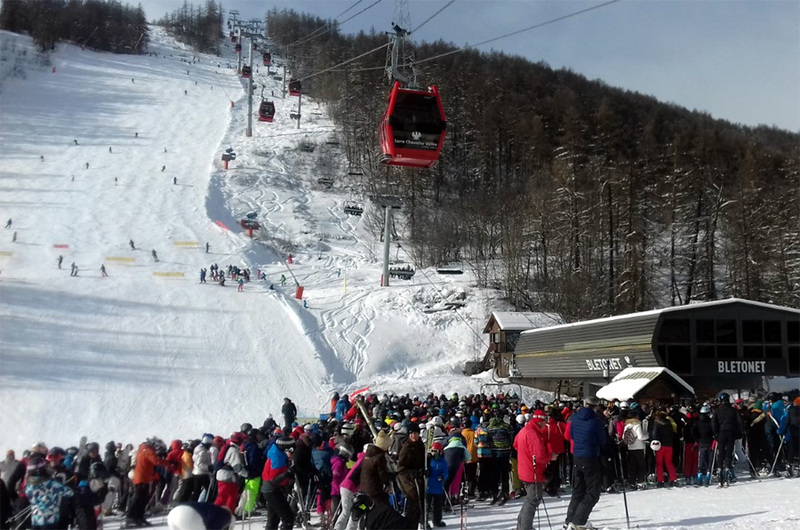 Meanwhile, catch Oli Walker's War & Piste, lift queue tactics for February half term. Been snowing all morning and avy risk is at 4 and, after yesterday, I'm not at all surprised because, as I discovered, there is obviously a weak layer caused by the rain on 31st January and warm conditions, followed by freeze. 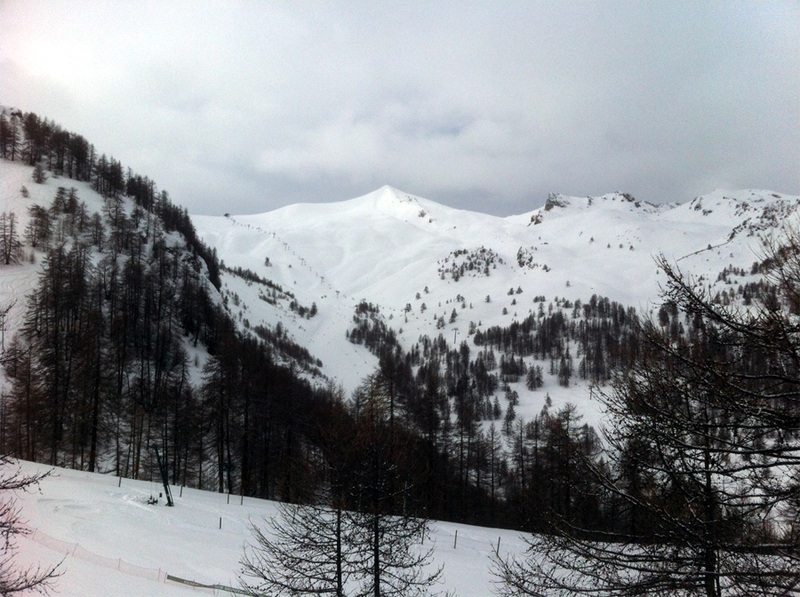 So we did go up to Monetier, and no need to ski the trees as there was plenty of untracked on those pistes that were not officially open, due to not being pisted. Plus the cover in the trees lower down was sparse with many a tree stump. 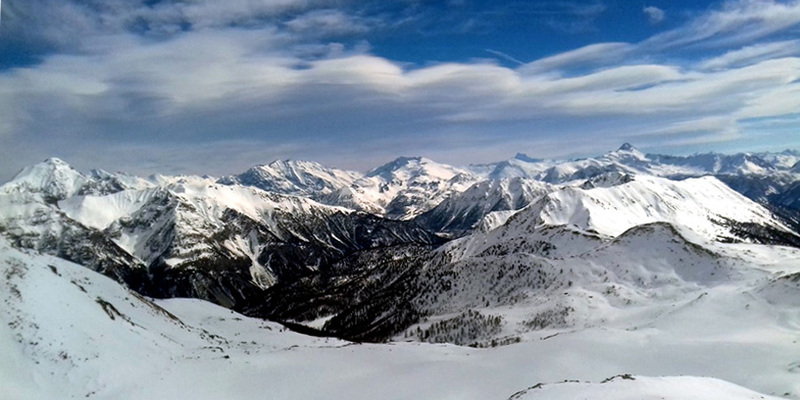 Gradually the heavy snow stopped and conditions became much brighter and we saw that they had opened the Cibouit chair. We cautiously traversed across and picked our line. Snow was really good. We then came to a steep pitch in the trees and I went over first. I just thought it was loose snow / sluff falling but in a nano second I was taken out by the powder slide (plaque friable) and ended up pinned to a tree. As the snow was briefly engulfing me I did think my number was up! In the slide I lost a ski and a pole. 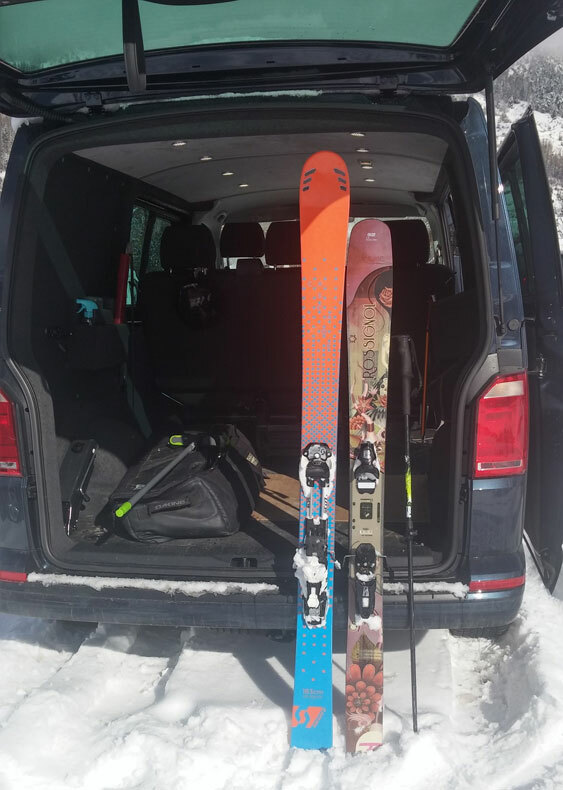 We dug looking for the ski and pole for around an hour and had no luck finding them, but my mates found another ski which I was able to fit to my boot. This was pretty amazing at it was an obvious 'ladies' ski. In the carnage I've strained my knee pretty badly but was still able to ski out which was interesting to say the least on the two different skis. And this morning knee is swollen and sore, so think I'm off games for a while. So looks like I'll be back up there in the Summer hunting for my ski! Been snowing since around 04:30 but I did not hear any snowploughs and roads don't look as if they've been cleared. Of course, it's Saturday, transfer day and, maybe, another Snowmageddon? Up to Monetier this morning for the trees me thinks as viz is not great. I can always tell there's been snow overnight / early hours without getting out of bed, and to a certain degree how much in the valley, and I don't mean by looking at my own webcam from the comfort of my bed, which I can in fact do! Two sounds means there's been snow, that of avy control blasting up the hill and snowploughs along the road, but however I have not heard the mini snow ploughs in our parking areas which means we only have a dribble down here, and opening up the blinds this morning confirms this; but blasting up the hill suggests more snow, so first lifts it is! We had a great morning, 10 of us hiking up to the Refuge Napoleon just below the Col d'Izoard whilst I skinned up to the actual Col and then skied back down to meet them all for lunch. However during lunch there ensued quite a commotion, with people getting up from the tables and looking out of the windows. 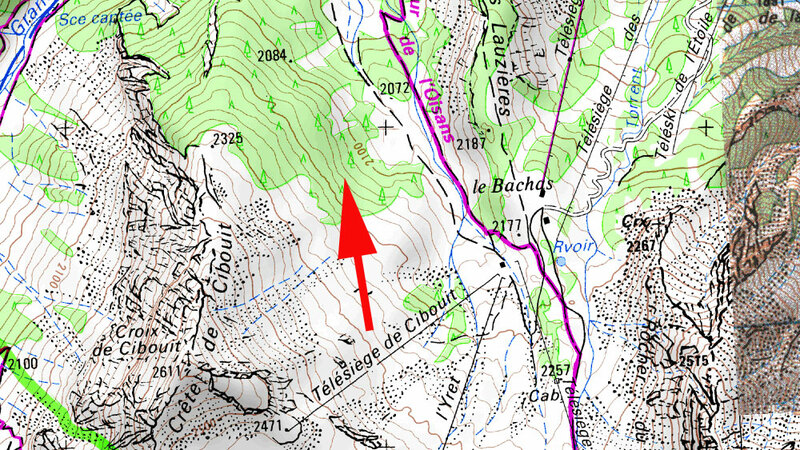 There had been a huge avalanche just under 3km away on a big face below the Col de la Roya in a popular ski touring area. I went outside and could see the CRS/PGHM Rescue helicopter circling, and then having borrowed some binoculars could make out around three people on the slope and dogs searching. They had been dropped by the helicopter. I felt quite useless being so far away but having avy search gear in my pack but being unable to get there to be of any use. 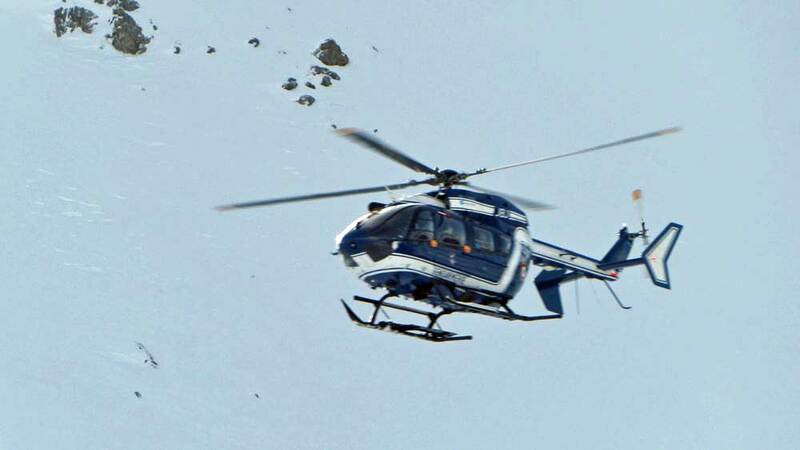 Even with the heli searching, if skiers were in the slide, they might not have beacons so a manual search would be necessary, hence the dogs already working the slope and the heli searching for any transceiver signals from above and I presume using other equipment such as thermal imaging. There was a slight element of lost in translation, as I tried to understand who called the rescue service and when did the slide occur. 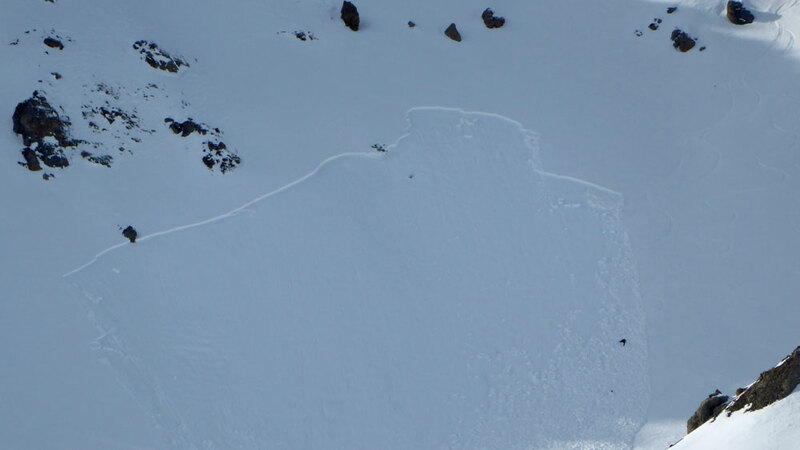 With the temps warming up over the last few days that was probably a contributing factor, and the aspect of the slope was similar to a slide we'd seen off the Eychauda a few days before (see main image, above) where a wind slab had built up on the lee side after strong NW'ly winds. It really did leave a bad feeling, I'd checked the avy risk in the morning and it was only 2 above 2,000m and where the slide occurred was a popular ski touring route (see map and dashed blue lines are ski tour routes), for me and maybe a few others it's worse as we ski tour and know the dangers, and going back down the worry was whilst others were enjoying the toboggan run back down what if people had just died there? On returning home I checked the local media for any news but could find nothing. I then looked at the photos I had taken and you could see tracks leading to where the slide happened, and just below those tracks you could just make out a man and dog searching, but were they just old tracks? Fast forward to this morning, and relieved to find a news report and that there were no victims. The alarm was raised by the Refuge when they spotted the slide. Stay safe in the backcountry. 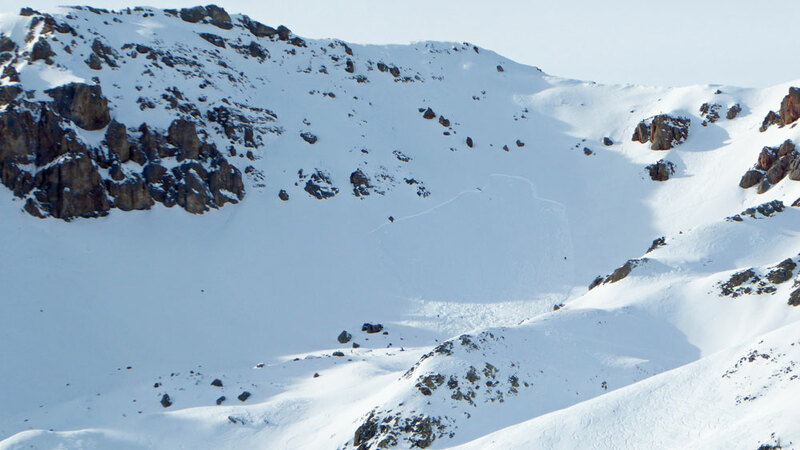 Check out The Whumph Factor and Heuristic Traps, human factors that cause avalanches and Jeremy Jones's Five Red Flags to avoid them.